A new addition to my Speech room this month is Zingo! 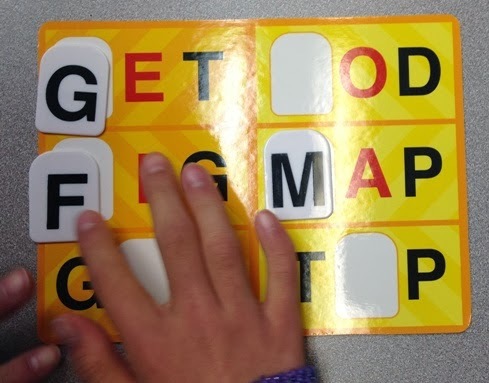 Word-Builder, courtesy of ThinkFun. Many of you are probably aware of the regular version of Zingo!, a fun and novel way to play Bingo. Zingo! 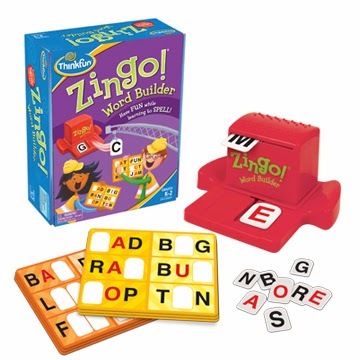 Word-Builder is similar to the original in that the game consists of game boards, plastic tiles, and a "Zing Zinger" (tile machine). The game boards feature 3-letter words, with one or two of the letters missing. 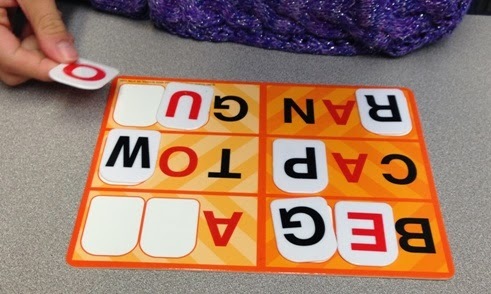 On their turn, students move the Zing Zinger to release two tiles and have to figure out if the letters can be used to create words on their game board. The person to complete their board first is the winner. There are two difficulty levels: one side of the board is missing only one letter (in either initial, medial, or final position), and the other side is missing 1-2 of the letters. One thing that is great about the game boards and plastic tiles is that all vowels are highlighted in red. This makes it very visual for students. Another positive aspect about this game is that the Zing Zinger now has slots on the top so that you can discard your tiles more easily (unlike my other/older version). Level 1 - one letter is missing. have students substitute sounds, e.g., "You made the word 'bat'. What word do we get if we say /h/ instead of /b/?" Level 2 - 1-2 letters missing. I set up a game board and the Zing Zinger on the document camera so that the whole class could see it. Next, I had students take turns coming up, move the Zing Zinger, and try to figure out where to place the letter tiles on the board. When they got stuck, their peers were allowed to help. The kids *loved* moving the Zing Zinger. They were super motivated, and we know that motivation is positively linked to learning ;). I think this game would be a fantastic addition to any K-2nd grade classroom to use either in a whole group or during stations. I will also be sharing this game with our Special Day Class teacher, since many of her students are decoding at the basic CVC word level. There are several different Zingo! versions available - Sight Words, Counting, Bilingual... make sure to go check them out here. Also make sure to read my other ThinkFun review of Rush Hour Jr., a great Speech room addition! In a few days, I will be writing about another great game by this company, so stay tuned for more!